Sapphires are naturally mined in various colors including blue, purple, pink, yellow and white. Whatever color a sapphire may be, higher saturation of color typically commands a higher price in the trade. The reason is simply that highly saturated gemstones are much rarer and generally more desired than their counterparts. It is common for sapphires to have secondary undertones. As an example, blue sapphires typically have a secondary undertone of either purple, green or gray. This is the highest color grading for our blue sapphires. Color of these sapphires is as deep of a blue a sapphire can get without turning opaque or being overly colored. Transparency of these sapphires is also excellent. Color of these blue sapphires is a shade less of a blue than intense. Such sapphires have extremely rich blue vivid color and are highly sought after. Such blue sapphires have as rich of a color as intense blue but don't have as much transparency as an intense blue sapphire. 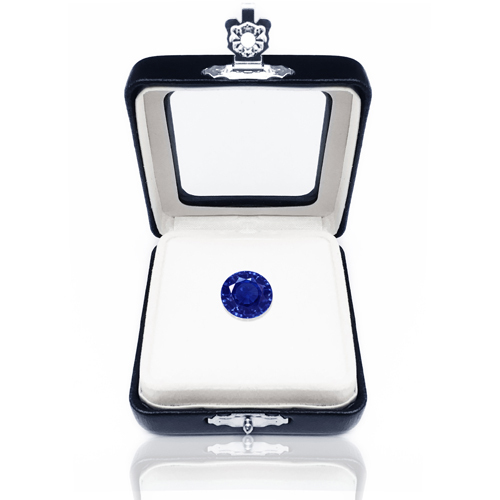 Such sapphires are still quite rare and in demand (formerly Royal Blue). Such sapphires are very pleasant to the eyes as they are not too dark or too light and have very good transparency to them. These sapphires generally have 50 to 70% color saturation. Such sapphires are lighter than medium blue sapphires and generally have color saturation of 20-40%. These sapphires have excellent transparency and exude significant white reflections and also often are referred to as pastel blue sapphires. Sapphires of this color offer a great value as the color of the stones is a pleasant deep blue but have fair to good transparency. These sapphires have bluish black color and are opaque. This is the highest color grading for our pink sapphires. Color of these sapphires is as deep of a pink a sapphire can get without turning opaque or being overly colored. Transparency of these sapphires is also excellent. Color of these pink sapphires is two shade less of a pink than vivid. Such sapphires have good saturation of pink and are a great value as they are not as expensive as the vivid pink and still offer a good saturation of pink. These sapphires generally have 50 to 70% color saturation. Such sapphires are lighter than medium pink sapphires and generally have color saturation of 20-40%. These sapphires have excellent transparency. These are very light pink sapphires with color saturation of 15-20%. This is the highest color grading for our yellow sapphires. Color of these sapphires is as deep of a yellow a sapphire can get without turning opaque or being overly colored. Transparency of these sapphires is also excellent. Color of these yellow sapphires is a shade less of a yellow than vivid. Such sapphires have extremely rich yellow intense color and are highly sought after. Having a medium yellow color such sapphires are very pleasant to the eyes as they are not too dark or too light and have very good to excellent transparency to them. These sapphires generally have 50 to 70% color saturation. Such sapphires are lighter than medium yellow sapphires and generally have color saturation of 20-40%. These sapphires have excellent transparency and exude significant white reflections and also often are referred to as pastel yellow sapphires. These sapphires offer a great combination of golden and yellow colors. They are unique and are in demand. This is the highest color grading for our purple sapphires. Color of these sapphires is as deep of a purple a sapphire can get without turning opaque or being overly colored. Transparency of these sapphires is also excellent. Color of these purple sapphires is two shade less of a purple than vivid. Such sapphires have good saturation of purple and are a great value as they are not as expensive as the vivid purple and still offer a good saturation of purple. These sapphires generally have 50 to 70% color saturation. Such sapphires are lighter than medium purple sapphires and generally have color saturation of 20-40%. These sapphires have excellent transparency. This is the highest color grading for our white sapphires. These sapphires are absolutely colorless! Meaning they are as pure of a white color as sapphries can get. These sapphires have nice white color but sometimes can have a very slight tinch of yellow in them. These sapphires offer a great value and are highly sought after due to their reasonablness. Diamond and Sapphire prices are impacted by the 4C's. However, the single biggest price driver for a sapphire is its color. It is for this reason, majority of the sapphires are heated to enhance their color and cut to maximize their color. In general deeper/richer color and brighter gemstones will fetch a higher price. Color is a personal preference. While there is no right or wrong answer, prices are set by supply and demand for specific colors. We recommend customers find the color that appeals to them the most and not be swayed only by price. Clarity refers to the imperfections visible inside a sapphire. Typical imperfections in a sapphire include feathers, silk, cavities and color zoning. The placement and size of the imperfections affect the value of a sapphire. Unlike diamonds, gemstones are graded without any tool or magnification to make clarity judgments. Instead, gemstones are inspected by holding them 12 inches from the observers eye and tilting them in various directions to visually inspect if any inclusions are visible. The grading below is based on this methodology. FL - This is the highest clarity grade a sapphire can have. This means the gemstone is 100% clean to the eye to a trained, experienced gemologist but not necessarily under 10X or higher magnification. 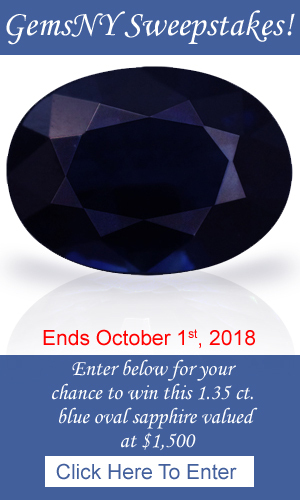 VVS1, VVS2 - This grading means the sapphire would be 100% eye clean to an untrained eye but a gemologist might be able to observe very, very tiny inclusions from certain side angles. VS1, VS2 - This means very tiny inclusions would be visible under very close inspection to an untrained eye. SI1, SI2 - Slight visible inclusions upon inspection would be visible to an untrained eye but inclusions are not affecting the transparency or the color in the sapphires. Clarity can have a material downward impact when the imperfections are significantly affecting the appearance of the gemstone. There is no value added if a sapphire is clean to the eye vs. magnification. What Clarity is right for you? If a customer wants an above average clarity gemstone, then it better to stick with minimum VS2 clarity grade. However, for customers that want to view very little to no visible imperfections with the eye, it is better to look for VVS2 and higher clarity sapphires. Sapphires are dichroic gemstones, as such the sapphire color you see will change depending on the angle you view the gemstone. Cutters take advantage of this property to cut a sapphire in a way to show the most desired color in the faceted gemstone when viewed from the top. It is for this reason that some sapphires are cut deeper and other shallower, to maximize the color concentration in a sapphire. Unlike diamonds, cutting a sapphire to text book proportions, will not guarantee amazing sparkle in the gemstone. The quality of the sapphire crystal itself dictates the sparkle you will see. Some crystals are opaque and others very transparent. Because there is no standardization of cut in a sapphire, it is the least important of the 4 C's in affecting the value of a sapphire. 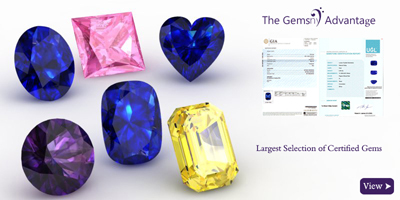 Pricing of a sapphire is determined from the physical measurements and less so from its carat weight. Sapphires are cut to maximize the color in a sapphire. As such, cut has an indirect affect on a sapphires value. In general, cut of a sapphire is not a material direct price driver. In general, the cut of a sapphire should not affect your purchasing decision. 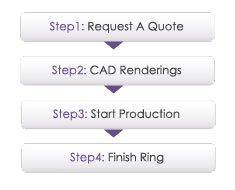 However, the desired look of the ring can impact the sapphire cut requirement. Certain settings look best with well proportioned sapphires. Carat weight is the unit of measure for sapphires. One carat is equivalent to 0.20grams. In general, the higher the carat weight of the gemstone, the higher the price per carat. There are price jumps once a sapphire reaches 1ct, 5ct, 10ct and 15ct+. To gauge the size of a gemstone (visual appearance), it is always better to look at the physical measurements of the gemstone as opposed to the carat weight. Color stones tend to be cut deeper than diamonds and will therefore will almost always have a higher carat weight. Gemstones which are unheated have only traditional process of cutting and polishing applied to them in order to improve the appearance or durability of the gem. Unheated sapphires are rare, especially in larger sizes. Enhancements in sapphires are used to improve or change the color in a sapphire. Heat Treatment - This treatment uses high heat to induce a color change. It has been in the industry for a long time and is accepted industry wide as an acceptable PERMANENT treatment. In fact, this treatment is so common that in the trade if an individual asks for a sapphire it is understood they want a heated gemstone. Diffusion - In this treatment there is a use of chemicals in combinations with high temperature to induce color change among gemstones. This treatment is very common among yellow sapphires with the use of Berylllium as the agent. However, in general this is not an accepted treatment and must be disclosed. Irradiation - This treatment uses radiation to induce color change. Because this treatment is not stable and permanent, it is not a generally accepted treatment in the trade. Treatments that are not generally accepted in the trade such as diffusion/irradiation will have a material downward impact on its price. Untreated sapphires typically trade at a 25% premium over similar quality heated sapphires. The premium rises as the size and quality of the sapphire increases. There are material increases at 5ct, 10ct and 15ct thresholds for untreated sapphires. Please note that there is very limited to no premium for commercial quality untreated sapphires. The desired quality and allocated budget will determine what treatment is right for you. It is always best to purchase an untreated sapphire where possible. Untreated sapphires have much higher long term price appreciation than treated gemstones. Kashmir This is considered the best mine for sapphires but all natural Kashmir sapphires mines have been exhausted and thus no new Kashmir sapphires are mined in nature. Ceylon Ceylon is another name for Sri Lanka. Sapphires from this mine are extremely rare and are of very high quality. These rare stones generally have very good to excellent transparency and a pleasant blue color. Burmese Burmese sapphires are known to offer very nice royal blue color but generally will not offer excellent transparency. Most stones have good to very good transparency. Madagascar These sapphires are very similar to Ceylon sapphires in terms of quality. They offer excellent transparency and vivid blue color. Thailand Sapphires from this mine are rare and generally have a pleasant navy blue or royal blue color. Australian Australian sapphires are of generally commercial grade. Sapphires from this mine are used in significant amount of world's sapphire jewelry and are generally midnight blue in color and have fair to good transparency. Sapphires from desired mines such as Kashmir, Burma and Ceylon will carry a premium over sapphires from other origins. The premium grows as the quality and size/weight of a gemstone increases. What origin is right for you? For most customers origin should not factor into the decision making process. All origins produce low, medium and high quality gemstones. It is more important to find the quality of the gemstone you want than the origin. For investors, it is always better to purchase a high quality gemstone from a premium origin.